The Siemens Emotion Duo is a 2-slice CT scanner offering subsecond scanning, a comprehensive range of clinical applications, and cost-effectiveness compared to the single-slice through its Lightning UFC dual-detector technology. The Siemens Emotion Duo provides anatomical volumes with thinner slices for excellent reformatted images, higher mAs for improved image quality, and less stress on the X-ray tube compared to the single-slice. 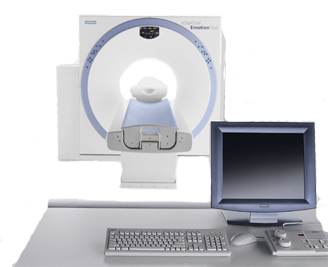 The Siemens Emotion Duo is a excellent, affordable option to bring high resolution imaging and a wide range of clinical applications to your facility.